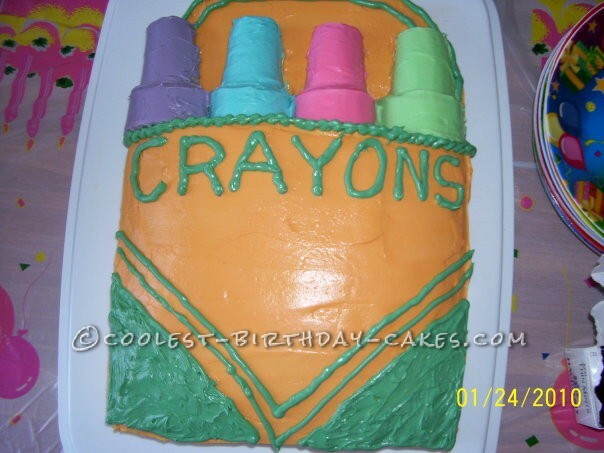 I used a 9″ x 13″ cake pan to start this Crayon Box cake. When the cake was cooled I cut out a section at the top, like a step. I then dirty iced the cake with butter cream icing. Trying to get the color of the crayon box just right to forever! I finally got close enough and covered the cake in the yellow/orange color. Next I took 2 ice cream cones with flat bottoms. With a very sharp knife I cut them down the middle. These became my crayons, but first I had to ask my daughter what color of crayons she wanted (this very little step just makes it a little more special for the child). So I covered each cone in the colored icing and carefully placed it on top, into the cut out step. Lastly I used green for the lines and the word crayon. Even with the step cut out there is lots of cake still. 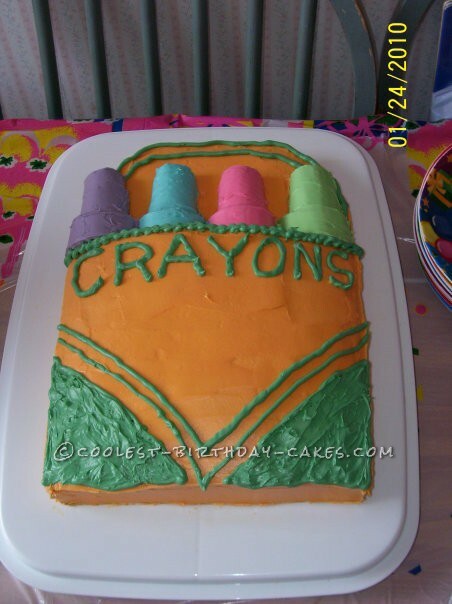 Everyone loved the cake, but the kids really loved the crayons/cones, lol. Birthday cake idea Posted by Denise B.